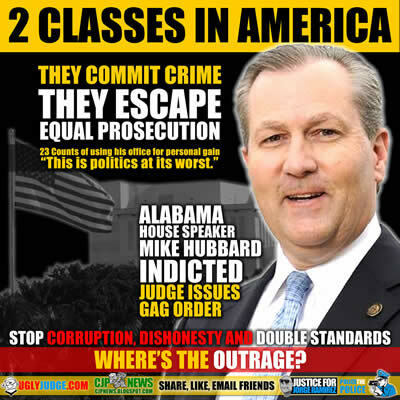 Alabama House Speaker Mike Hubbard indicted for 23 counts of using his office for personal gain and soliciting things of value while in office. When police kill innocent, unarmed people the first thing they do is leak false info attempting to destroy the character of the victim and help the public opinion rationalize their actions. Yet when they’re exposed of a crime our courts help them avoid prosecution, seal records and hide previous crimes and murder The double standards and two classes in America must be exposed. Alabama House Speaker Mike Hubbard, the architect of the state Republican Party’s remarkable turnaround, was indicted Monday on 23 counts of using his office for personal gain and soliciting things of value while in office. If convicted, the 52-year-old Hubbard could face up to 20 years in prison and $30,000 in fines for each count. Hubbard’s lawyer said he will hold a press conference Tuesday to rebut the charges. Hubbard reported to the Lee County Jail where he was booked. If convicted, Hubbard faces a maximum penalty of two to 20 years in prison and up to $30,000 in fines for each count. Hubbard, 52, who led a historic Republican takeover of the state Legislature during the 2010 election, was charged after an investigation in his home county that has lasted more than a year. One count of using state equipment, materials, etc. for private gain. 48 INVESTIGATES: Did AL Speaker of the House Mike Hubbard use power to benefit himself?